Let’s face it, the Atlanta Braves are probably not going to be any good this year. The good news is that there will always be the contingent who go to Braves games just for their legendary Waffle House stand. Now, if you thought that the Braves were going to be a one trick food pony this season (no, they’re not serving fried pony), well think again. The Braves get me. They know that there are many days that I’ll go to a ballpark and I’ll think “Man, this is the last game I’m going to get to for a few weeks. 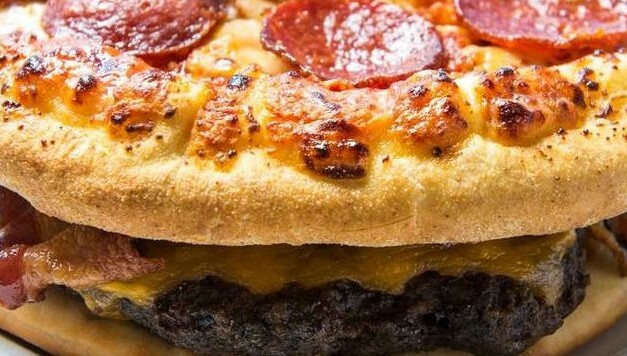 Do I have the burger, or do I have the pizza? It’s such a tough choice which I’m not capable of making because I have the mentality and the diet of a 12-year-old. Whatever is a fan to do?” Well now, thanks to the Braves, I don’t have to make that choice. The Braves also introduced other food items, including the TED … which stands for “The Everything Dog”. For those who can’t read the sign, that dog has popcorn, chili, tortilla chips, french fries, jalapenos, beer cheese, Coca-Cola infused barbecue sauce, and of course the all beef hot dog on a pretzel bun. @FOXSportsSouth @Braves popcorn??? C'mon. Where's the BACON???! Fair point. It stretches the definition of “everything”.